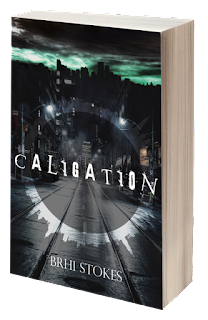 I always like to welcome authors to the blog - and this week I'm delighted to have a visit from Brhi Stokes, whose new book Caligation is out on July 29. Brhi will be joining me for a Q&A too on release day, but in the meantime, she gave readers of the blog a chance to peep inside her urban fantasy - a glimpse of a world of strange, unnatural dangers, and a young man lost within it. Enjoy! And see you back here for the chat on launch day. "Darkness closed in on him like a pack of hounds. Buildings passed, warehouses, factories; shadows of silent windows disturbed every so often by dim light, taunting him." By the time he headed back home, the sun was hanging low in the sky and the streets were beginning to come alive. Too alive, Ripley realised, rounding a corner and then stopping abruptly. A few metres ahead of him, in the centre of the street was a melee. Several creatures with elongated limbs, angular heads and a mottled mix of fur, skin and scales were on the attack. Without the pitch of night to hide their forms, Ripley could clearly see the deformities; the spines and horns and tufts of fur that covered the sinewy muscles of the creatures. Some moved with speed and grace, others in lumbering strides that impacted heavily on the road. Guttural sounds ripped from the group as they lunged and snarled at their opponents. A gunshot ripped the air and one of the creatures reeled, blood pouring from the side of its face. Once it had gathered itself, it lashed out with a viciously spiked claw sending the shooter sprawling. It leapt, only to find its jaws clamped around the thick of a heavy crowbar as one of the woman’s compatriots dove in with such great strength he was actually able to hold the beast off. His crowbar snapped, and the creature fell upon the man with claws and teeth. The woman he had saved leapt towards the creature and thrust out a hand. Even from this distance, Ripley could see the sudden melting and hissing that came from where her hand touched its bare flesh. The creature reeled once more, a good chunk of its skin turned a brackish red, steaming. The two other creatures were under a barrage of gunfire, but they weathered it well. He watched as one of the humanoid men darted out of the way of oncoming teeth and clung like a spider to the wall nearby, sticking even without holding it. One of the less occupied creatures spun suddenly, its eyes glowing a deep, angry red as it scanned the street. It caught sight of Ripley and, with a growl like nails in a whirling drain, dug its claws into the ground and bounded towards him. Pink saliva bubbled from between its innumerable teeth and a long, snake-like tongue lashed out at him. Ripley stumbled back, hands reaching down to his pockets in search of any sort of weapon but the creature had sprung. It reeled suddenly in mid-air as something exploded in front of it, sending liquid and fire splattering across the ground. From the liquid, a sickly green gas rose and the creature began to prowl backwards, snarling and gargling as small bits of fire licked at the tufts of fur across its scaled face. He did not need to wait for a second chance. Ripley turned and bolted down the nearest alley. Behind him, the sound of sirens was accompanied by the screeching of tires. His apartment was safe and warm in comparison. He did not leave, and no one came to collect him. A small part of him wondered if he should call someone but he pushed it aside.